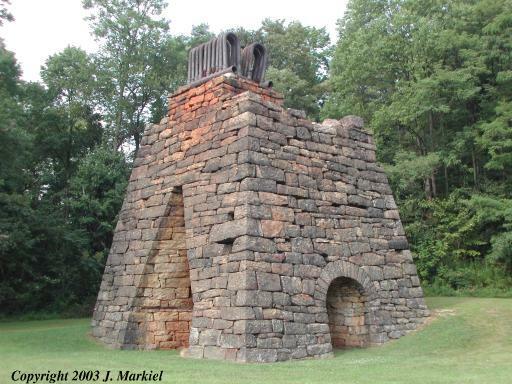 Eliza Furnace was the first of three furnaces constructed in the Blacklick Creek Valley. 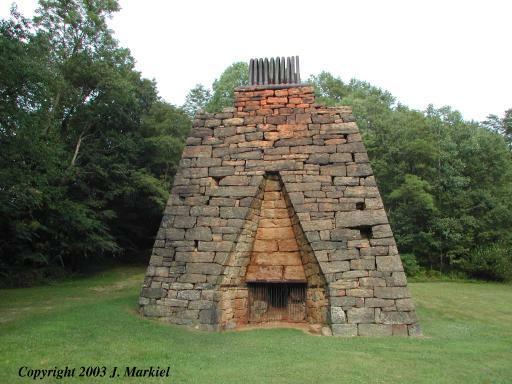 The other furnaces were Blacklick Furnace and Buena Vista Furnace. 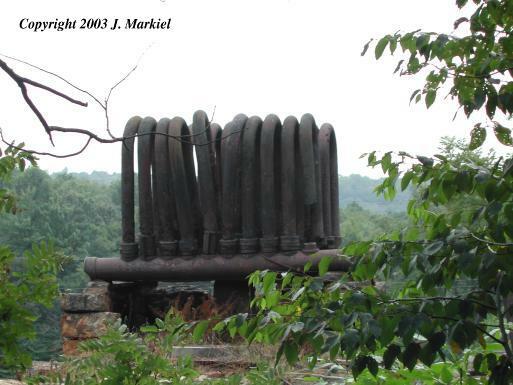 The most important feature of this furnace is the heat exchanger pipes, which may be the only remaining elements left in the United States for this era. 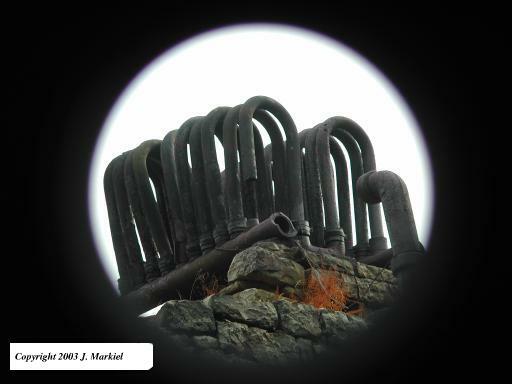 Water powered bellows pushed blasts of air up to the heat exchangers, which were heated by exhaust gases from the burning charcoal in the furnace. After being heated, the air was then piped down the side of the furnace stack to the left hand tuyere, where it was forced into the hearth. However, the entire process was very wasteful - the actual air temperature only increased 10-15 degrees. The overall furnace site is located at a county park and is in reasonable condition. The back portion of the stack appears to have some damage, possible from the reinstallation of the heat exchanger. The front portion of the cupola has fallen away and been discarded, permitting a view of the inner cupola wall. The wagon path to the top of the hill is still evident, but any evidence of slag or charcoal has long been removed. 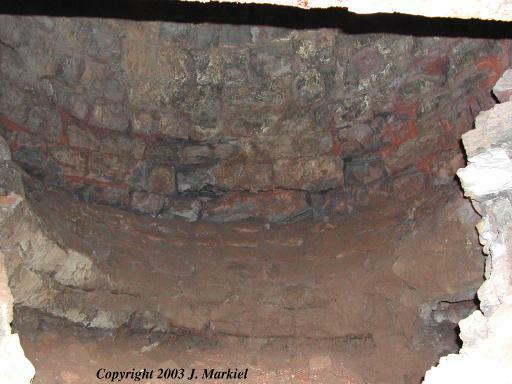 The engine house was probably built to the left of the furnace, but no evidence of a foundation exists. I looked down the creek bordering the site and saw some very limited amounts of coke and slag, but nothing significant. Much of the area appears to have been cleaned up with the building of the city park and neighboring Rexis Access Trail. Built By: David Ritter and Lot Irvin. Thomas Deveraux (stone mason) and two Irish immigrants (John and William Gillin) completed the actual stonework on the furnace. It is not known where the heat exchanger element originated. 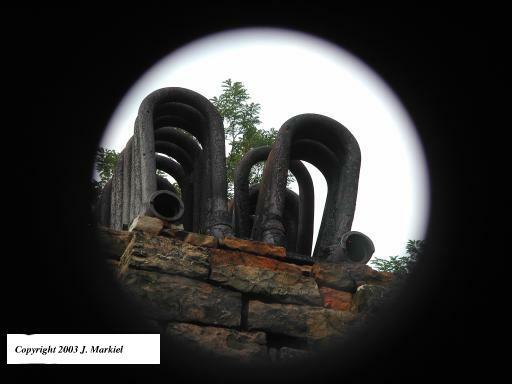 The blast was driven by a water wheel, which operated a bellows. This was obsolete technology for the period, since most iron furnaces in the region converted to air tubs by the mid 1840's. 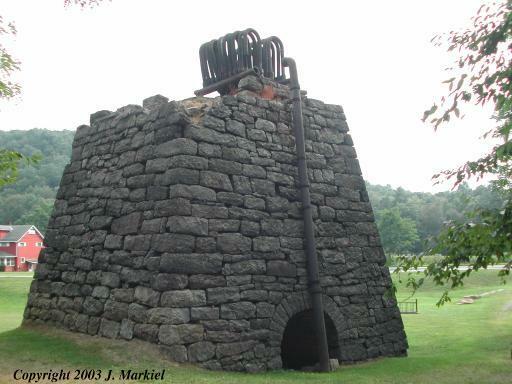 For more information of air tubs, see Cornwall Furnace. The daily charging of the furnace typically involved 2-3 tons of iron ore, 1-1.5 tons of charcoal, and 25-100 pounds of limestone. 1-1.5 tons of charcoal was approximately 800-1000 bushels of charcoal, or about 1 acre of hardwoods. 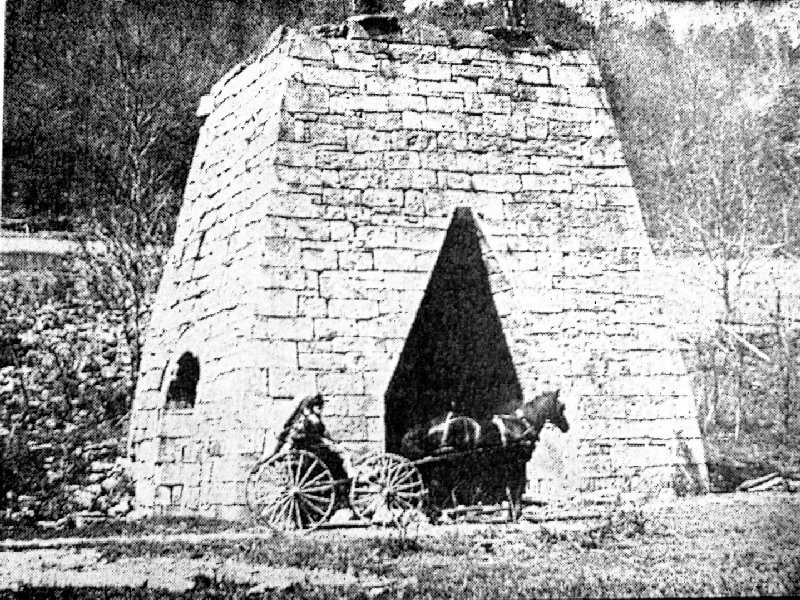 The furnace was a average size for Western Pennsylvania, employing about 90 men and boys, and used 45 horses or mules. Some additional information on Eliza Furnace has been documented by the Indiana Country Parks This Adobe file was donated by the Indiana Department of Travel and Tourism. 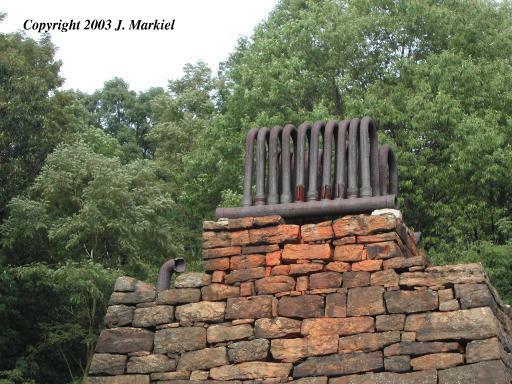 The Indiana County Parks has a website dedicated to this furnace, located at Indiana County Parks. Old Pictures - The following picture is a early shot of the Eliza furnace. Located on the edge between Indiana and Cambria Counties. Located on the edge between Indiana and Cambia Counties. Take Route 22 to PA Rt 403, go north to SR 2012, turn right (east). The road will make a 90 degree turn right, then 90 degree left. (You will pass right by the Rexis Access Trail where a sign is posted for Blacklick Furnace). When the road dead ends (Pa Rt 2013), make a left hand turn and proceed to Vintondale. The furnace is just east of the creek and right before entering Vintondale proper. A map can be located at the Ghost Town Trail link.